You need ONGAA CAM ! Stop programming for just one position. ONGAA CAM can generate MPR files for any machine position ‘on demand’. ONGAA CAM does not produce G-Code. Instead it creates 100% compliant MPR / BPP files then uses the HOMAG or Biesse post-processor to create the final machine instructions. This guarantees that all approach and withdrawal modes provided with the machine are adhered to and no machine specific customization are required. Tired of doing things twice? 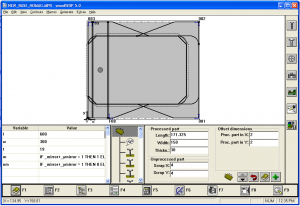 (AutoCAD -> Paper -> WoodWOP) With SOLIDWORKS and ONGAA CAM you apply machining to the model with all the options. Any Model changes — are reflected immediately in new WoodWOP files . Let ONGAA CAM Nest for you! ONGAA CAM for Biesse is now available. A recent time study conducted at Windowcraft Industries has show that using Solidworks and ONGAA CAM has produced time savings of 62% in programming and 46% in designing over the traditional AutoCAD and WoodWOP method. ONGAA CAM has proven its value in improving the efficiency of programming your CNC around the world. ONG Solutions, with ONGAA CAM, has become a SolidWorks Solution Partner. Aug 1, 2013. Attaining this goal is not only important to us but to our customers as well. As a SolidWorks Solution Partner, we have access to technical resources directly from Dassault Systèmes SolidWorks Corp. which shortens the turn around time for both Version Verification and defect resolution. The whole team at ONG Solutions is proud of this achievement and is already planning the path to the next certification level. From dreaming up the parts to parts coming off the CNC table, the entire manufacturing process can be summed up in the expression "Dream to Machine". Few applications today serve the small to medium manufacturer well. By using a 'parametric' design approach and SolidWorks with ONGAA CAM, the time and effort can be dramatically reduced. Reset the SolidWorks Planes to Z axis up — and call that the Top. © 2019 — ONGAA CAM. All Rights Reserved.